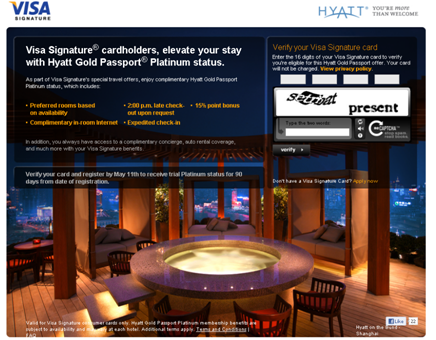 Hyatt is offering Platinum status, as part of 90 day-offer for Visa Signature cardholders, via this link. Signature cards include the Capital One Venture Card, United Mileage Plus Explorer, and Chase Sapphire Preferred Cards, amongst a slew of others. To keep the status beyond the 90-day window, one needs to complete 8 stays between now and the end of the promotion, May 11. You may want to time it accordingly if you have a bunch of stays coming up, as it begins upon registration. I had heard of a number of registration errors, so I decided to go ahead and try my own luck, using my Chase Preferred Card number. It did allow me to register, but instead of allowing me to use Firefox as my browser like I usually do, I ended up having to use Internet Explorer. 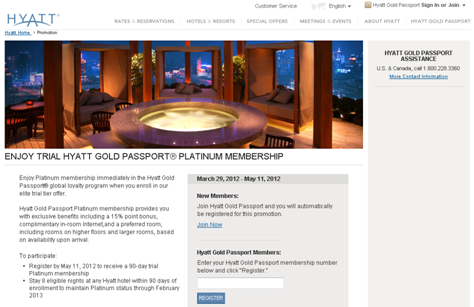 Where this offer gets real juicy is if you apply for the Hyatt credit card from Chase during that 90-day window. While the sign-up bonus for a new or Gold (entry-level) status member is 2 award nights, the Platinum member benefit is 2 award nights and 2 suite upgrades after your first purchase. A suite benefit if you ask me…. Anyway, bad puns aside, rather than try to rack up 8 nights a Hyatt properties, I plan on optimizing this deal by applying for the Hyatt Card, which includes comped Platinum status. UPDATE: Chase is currently running better offer, with the annual fee effectively waived for the the first year. In addition to all of the same benefits as before, a $75 statement credit will be awarded after the first purchase on the card. The sign-up link has been updated accordingly. Hat Tip to One Mile at a Time.